Who's Behind Mumbai's Rush-Hour Bombings? Renewed Terrorist Attacks: Who Would Stand to Benefit? The bombs went off just as most of Mumbai was ending the workday. At 6:45 p.m. on July 13, Janardhan Bedkar, 35, an office helper at a diamond showroom in Opera House district, went on an errand for his boss, picking up a packet from a nearby paan shop, which sells various types of India's equivalent of chewing tobacco. As he stood at a roadside shop, the area around him was buzzing with activity, as is usual for the business district at that time of evening, when offices begin to close and people head home. Nearby, at a cart selling grilled sandwiches, a pregnant woman shared a bite with a friend. Suddenly, he heard a deafening noise and saw carts around him flying. "Next thing I knew, I was lying prone some meters away from where I had been. The paan shop and everything else was wrecked, their remains lying scattered all over. As I took to my feet and ran desperately to get away, I saw the pregnant woman crushed under dozens of feet as people tried to run away. I don't think she would've survived. There was a stampede as people ran helter-skelter, not sure where to go." 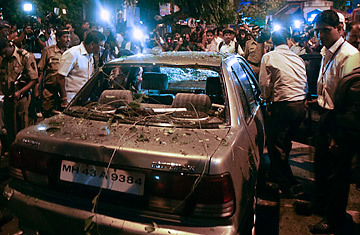 Mumbai was hit by a total of three serial blasts in heavily populated areas. Home Minister P. Chidambaram gave a press conference at 9 p.m. local time confirming 10 people dead and 54 admitted to the hospital with injuries. The number of injured could be higher, he said, and the death toll also could rise. Maharashtra state officials reported different numbers  the chief minister told local television channel CNN-IBN that there were 13 dead and 80 injured. A survey of local hospitals late Wednesday by TIME indicated 19 fatalities. The Home Ministry confirmed only the obvious: that the coordinated blasts were a terrorist attack. There was no word yet on who might be responsible or whether the blasts bear the imprint of local or foreign sources. Terrorist attack is a loosely defined term in India, encompassing everything from the Mumbai underworld to the as-yet-undefined group called Indian Mujahideen to the much more organized and deadly Pakistan-based group Lashkar-e-Taiba, whom Indian and U.S. authorities blame for the Nov. 26, 2008, Mumbai attacks. In separate statements, both U.S. President Barack Obama and Indian Congress Party chairman Sonia Gandhi condemned the attacks. Obama indicated that the U.S. would cooperate with India's search for the perpetrators. On its face, the incident looks much more like the serial blasts that hit Mumbai in 2006 and in 1993 than the infamous three-day-long terrorist attacks of 2008. As in those earlier incidents, the bombs were planted and detonated surreptitiously  one television channel showed images of a forensic investigator picking through the remains of a tiffin box, the ubiquitous stainless-steel lunch container that might have been used as a container for an IED. In 2006 the explosives were packed into pressure cookers. This time, Chidambaram said, one of the bombs was planted inside a car, the other on a motorcycle. Other unconfirmed reports said one of the bombs had been planted on top of an electric meter. The Mumbai siege of 2008, on the other hand, was conducted by a team of heavily armed commandos on a suicide mission, a very different kind of attack requiring a much greater level of training, planning and logistical sophistication. In the current incident, the Opera House bomb was believed to be the worst of the three. But the other two were destructive as well. The bomb in Dadar was set off in an area known as Kabutar Khana, named for its central landmark, a pigeon house established by Mumbai's Jain community, which is known for following strict vegetarianism. The bomb exploded inside a Maruti Esteem sedan, which was parked near a bus stop, one of the new all-metal structures that have come up in India's cities as they improve their infrastructure. The bus stop was bent into pieces with the force of the blast, and the impact caused at least three injuries. Metal, glass and some lemons from a vendor's cart were scattered all over, in an area that is so crowded that in the evenings, it's hard to move through the sea of life. An eyewitness to the blast in Dadar, a retired man named Jayantilal Shah, 68, says he was in his one-room flat in one of Mumbai's chawls, or traditional tenement houses, waiting for a phone call when he heard the explosion. The doors opened, the ceiling cracked and the ground-floor windows in his building were broken by the force of it. He went out and saw injured people crying and the remains of the gray Maruti. Dadar and Zaveri Bazaar, a bustling jewelry market that was the site of the third explosion, were also targeted during the 1993 Mumbai blasts. What ties all these spots together is that they are packed with people, ordinary Mumbaikars. Zaveri Bazaar and Kabutar Khana in particular are associated with the powerful local Gujarati and Marwari business communities. The 2008 attack, on the other hand, singled out places popular with foreign tourists and the wealthy elite. But similar targets don't necessarily imply a similar source. The 1993 blasts were all linked to Dawood Ibrahim, the reputed kingpin of the Mumbai underworld "D-company," who is believed to have links with jihadist groups operating in South Asia and the Persian Gulf. However, Ibrahim never targeted Mumbai's merchants, and has been outside of Mumbai for years. The Indian Mujahideen, a group that has never been clearly defined, typically send e-mail messages claiming responsibility for attacks. That was their modus operandi in 2007 and 2008 following serial bomb blasts in several cities, including Ahmedabad, Bangalore and Jaipur. There was no e-mail known to have been sent on July 13. There have been other attacks since the vicious 2008 attack on Mumbai. Last year witnessed three such incidents, in Pune, Delhi and Varanasi. Responsibility for those attacks has not been clearly established, but their targets were similar to those in Mumbai in 2008: the German Bakery in Pune, a popular hangout for foreigners visiting a nearby ashram; a tourist bus visiting the historic Jama Masjid in Old Delhi; and in India's holiest city, a bathing ghat popular with foreign tourists. Indian authorities recently filed charges against 24 people, charging them with trying to recruit people from the large Muslim communities of south India, particularly Kerala and Hyderabad, into the global jihad. It isn't just coincidence, then, that a team from the National Investigation Agency was already in Mumbai investigating another case when news of the latest blasts broke. The NIA was created in response to India's widely criticized intelligence failures in the 2008 attack. Chidambaram said NIA officials have started their investigation of the July 13 attack. The National Security Guard, meanwhile, supplied the commandos who arrived belatedly but did eventually put down the Mumbai rampage. That group established a hub in Mumbai so they could respond more rapidly to an attack (a big criticism of their performance in 2008), and that's exactly what they did when the latest blasts hit, moving in immediately. Other teams and post-blast investigators from Delhi and Hyderabad were also quickly en route. This may not be a repeat of Mumbai 2008, but it's clear that some of those lessons have been learned.